Lady’s Walk House is currently available to rent. Located in Great Somerford you get a lot of house for your money with this property. 8 large bedrooms and enough land to run around in all day! It’s not often a property is available to rent in Holwell, mainly because there are not many properties in Holwell. The beautiful little group of houses is perfect if you want to get away from the crowds and relax. If you are looking to rent an old farmhouse in the Cotswolds, well, then this might be the one for you! 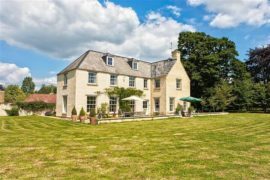 If you are looking for some time in the countryside and breath in the Cotswold air then Washbrook House might be the one for you. If you are looking for a large luxury property to rent in the Cotswolds then Beech Wood House might be the place for you! If you are looking for a luxury property to rent which is located near th M4 for easy access to London then Norcote house might be the one for you! This weeks luxury property for rent in the Cotswolds is this cute home in Minchinhampton. A large 6 bedroom house to hire with it’s own swimming pool (can not order the weather though) and nicely furnished. This weeks luxury property for rent is Pye Corner House in the very popular Broadway village. The village itself is very Cotswold and ticks a lot of the boxes. This week we are introducing a new section of our website, each week we will be highlighting a property to rent in the Cotswolds, this week it is Cornbury Park and The Cornbury Park Estate. Stay in a Large Holiday Home!